The holidays are here, and your house is a mess. You need a game plan to make the house presentable for guests, and ready to turn out those delicious dishes! Here's a how-to guide for the biggest holiday-prep cleaning jobs at home using Simple Green All-Purpose Cleaner - a safer, orally non-toxic and powerfully effective replacement for multiple cleaning products at home. Skip the bleach, ammonia and other harsh cleaners - Simple Green is safe to use on washable surfaces. It's your one-product solution to the toughest stains and most intimidating tasks on your holiday cleaning checklist! 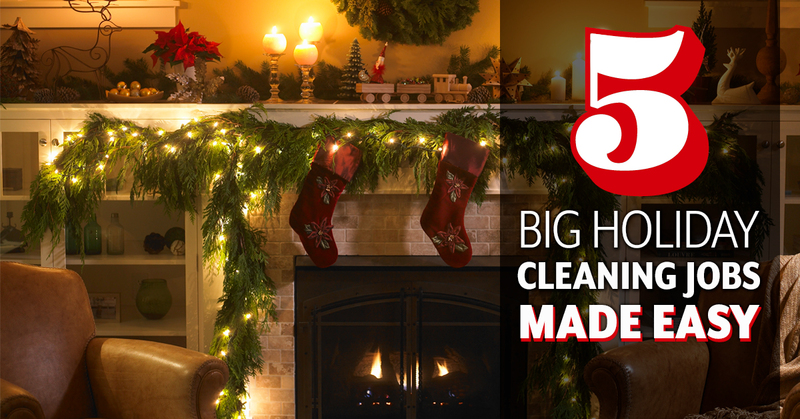 Here are 5 Big Holiday Cleaning Jobs Made Easy, using Simple Green All-Purpose Cleaner! Do you really want your guests to see that grease splatter on the oven door, charred chunks of food on the oven floor, grease-stained racks and other oven messes when lending a hand in the kitchen? Save yourself from harsh judgement and get it clean ahead of time. Here's how to clean your oven: Remove the oven racks for easier oven access, and place in sink for cleaning. 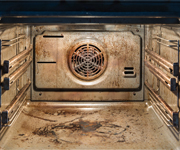 Pre-spray the entire oven – including the oven door and racks - with warm water or use a damp cloth to wipe out burnt food bits before cleaning. Spray full-strength Simple Green on the entire oven and racks (including the outside if necessary), and let the cleaning solution soak for up to 5 minutes to penetrate the baked-on grease. Then scrub with a stiff bristled nylon brush or non-abrasive pad to help loosen stuck-on food and grease. Rinse by wiping the surfaces with a warm damp microfiber or cloth, then dry with a clean microfiber or cloth and replace the cleaned oven racks. 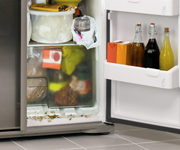 A stinky, cluttered fridge is a great way to ruin appetites at the holiday feast. You want a tough cleaner, degreaser and deodorizing formula that can lift the funky, grimy spills, messes and smells without harming surfaces or leaving behind a harsh chemical residue. Simple Green's got you covered. Here's how to clean your refrigerator: Remove all food items from the fridge, and pull out any removable drawers and racks to clean separately. Spray Simple Green on the entire surface area inside the refrigerator. Allow the product to soak for a minute or so on heavy soils and greasy spills. Then scrub away any food gunk or dried globs of sauce by scrubbing with a bristled nylon brush or non-abrasive scrubbing pad. Repeat this process in your sink for any drawers and racks you have removed. Rinse with clean water, wiping with a clean, damp microfiber pad or non-abrasive cloth to ensure a residue-free surface. Dry and polish with a clean microfiber pad or non-abrasive cloth. For any reflective surfaces, glossy finishes, polished metals and glass, this final step will leave a sparkling clean, streak free surface. Note: This tip is for wood burning fireplaces. For gas fireplaces, refer to this tip. For smoke stains, use this tip. Do you want Grandpa covered in a cloud of last year's ash when he tosses a log on the fire? We're sure he doesn't either. Tackle fireplace cleaning ahead of time to improve its look and safety, as soot, ashes and even embers can easily become airborne and potentially create breathing hazards or fire hazards inside your house – the last thing you want during a holiday gathering. Instead of cleaners that leave behind harsh chemical residues, Simple Green's non-toxic and non-flammable formula is safer for use in your home, and powerful enough to remove tough, blackened buildup in your fireplace. Here's how to clean your fireplace: First, protect the surrounding area by covering any nearby furniture and carpet with trash bags or old sheets. Keep a trashcan lined with two bags nearby to dispose of the ash, soot and debris. Don't forget to check the flue for bird's nests and other debris or damage that need to be addressed prior to cleaning. Remove the andirons and grate and take them outdoors. Spray them down with Simple Green and use a stiff bristled nylon brush to remove any buildup or stuck-on carbon deposits. Rinse thoroughly with water and dry with a towel. Then clear debris from the firebox using a fireplace shovel, and place any ashes and remaining wood in the trash can. 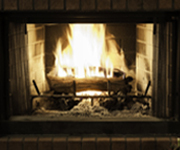 Use a small brush or fireplace brush to gently sweep the inside of the chimney and firebox. Use the brush or vacuum to remove the loose dust and ash. Prevent odorous build-up of charred, black creosote in the chimney by spraying it thoroughly with Simple Green, as high as you're able to safely reach. Use the foaming feature on a Simple Green spray bottle to help the cleaner remain on the surface longer. Don't worry if the Simple Green runs down onto the brick below – that will help in the following step. Clean the firebox - spray the inside walls with Simple Green, and use a stiff bristled nylon brush to loosen soot. Rinse thoroughly with water. Also clean fireplace screens and doors by spraying them with Simple Green. Use a stiff bristled nylon brush to scrub away any visible buildup on the screen, then rinse and air dry or dry with paper towel. Absorb any excess soot, cleaner or water with paper towel or rags. Replace andirons and grate. 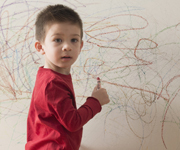 Unsightly scuffs and other marks on the wall can draw the wrong kind of attention at the holiday gathering. It's important to use a non-abrasive cleaning solution that won't discolor or diminish your paint when cleaning. Whether your walls are coated with latex or oil-based paint, Simple Green All-Purpose Cleaner is safe to use and great at lifting ugly stains off painted walls. Grimy grout on your tile counter or floors is an immediate eyesore, but restoring stained grout to like-new brightness can be done quickly and easily with Simple Green. You don't need to use harsh chemicals like bleach, ammonia or vinegar for cleaning, which can damage your grout and actually create more problems than they solve. Even a steel bristled scrub brush can work against you, scratching and damaging grout lines. Simple Green All-Purpose Cleaner's non-toxic formula reaches deep into the tiny pores of your dirty grout to eliminate deeply ingrained stains at the source without damaging the grout itself. 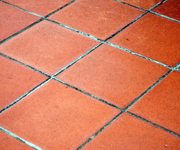 Here's how to clean grout: First spray the grout with water to help the cleaner penetrate soils. Then mix 1 oz. Simple Green to 1 cup of water in a spray bottle, and spray the area down. Allow a few seconds for it to penetrate the pores of your grout. Then use a toothbrush or soft bristled brush to scrub the dirty grout areas. For heavy-duty grout cleaning jobs, you can use a homemade paste mix of baking soda and Simple Green to pull deeply-embedded soils to the surface. The mix is an easy blend of three parts baking soda to one part Simple Green, which will form a loose paste that you can apply directly to the grout to lift dirt. Allow 10 to 15 minutes for the mixture to penetrate, then scrub with a wet toothbrush or soft bristled brush. Rinse with clean water. Wipe away any remaining residue with a clean, non-abrasive cloth.